Mesopotamia, the land of the two rivers Tigris and Euphrates, stretches before you. 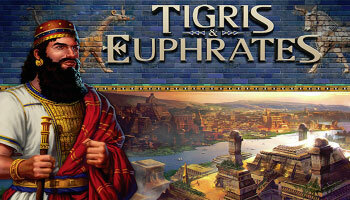 The game of Tigris & Euphrates allows you to take part in this fascinating saga. The two rivers form natural borders for an area which harboured several grand ancient civilizations. You and your people try to forge the mightiest and most balanced culture. 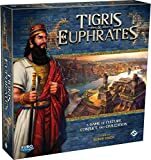 Players must collect points in each of the 4 colors (farming, trading, religion, and government) as a result of playing tiles, resolving conflicts and controlling monuments. After the final round, the points are calculated and the player with most points in their weakest category (to limit specialization) wins.